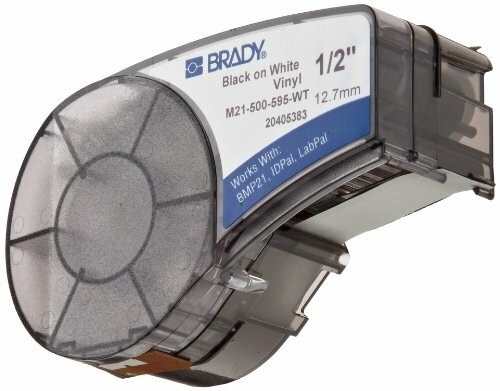 The Brady M21-750-595-OR label cartridge for use with BMP21 Series, ID PAL, and LABPAL printers contains 21 continuous feet of 0.75"-wide tape for labeling on smooth or textured surfaces in freezer environments. The tape is made of orange vinyl film and is coated with permanent adhesive on one side. Text prints in black. Brady manufactures signs, labels, lockout/tagout, safety devices, and printing systems and software used in the electronics, telecommunications, manufacturing, electrical, construction, education, and medical industries. The company, founded in 1914, is headquartered in Milwaukee, WI. Vinyl tape with multiple use cases including pipe marking, arrow tape, warehouse marking, warning panels, safety signs, arc flash and visual workplace labels in both indoor and outdoor use. Permanent adhesive tape adheres well to surfaces that are smooth, rough, highly textured, or powder coated, as well as to irregular surfaces or surfaces with low surface energy. Prints black text on white vinyl background with a clean gloss finish that is resistant to exposure to chemicals, grease, oil, and cleaning agents. Pre-packaged in a ready to use, all-in-one cartridge that includes printing ribbon and label supply, easy to install in compatible label makers.